Are Shakespeare’s characters the most interesting and universal in Western literature? Are Shakespeare’s Characters the Most Interesting and Universal? 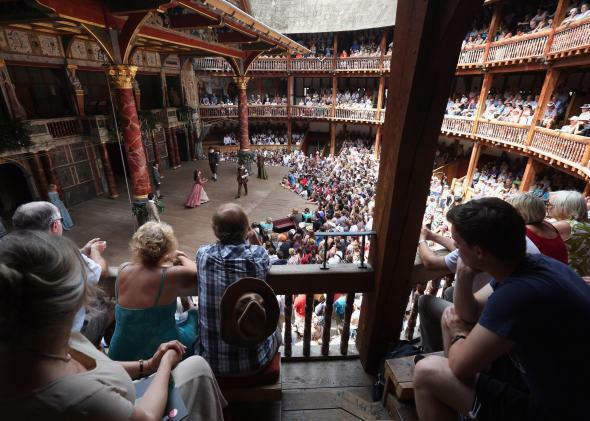 Audience members watch a production of A Midsummer Night’s Dream in Shakespeare’s Globe Theatre on July 16, 2013, in London. Well, here’s a slightly weird perspective on the question: I don’t think Shakespeare’s characters are all that great. Recently I was talking with some fellow actors after a rehearsal of Julius Caesar. My co-star in the show was quite livid about King Lear. She finds Lear totally unsympathetic and has no interest in the play. She would much rather see Henry IV Part 1 for a better treatment of the same themes. I personally find that aside from Shakespeare’s leads, the characters can be rather thinly drawn. Many make brief appearances with little characterization; they appear for the purpose of making contributions to the plot. And even his leads can be difficult to pin down, and I find that this owes more to vagueness and inconsistency than to insight. The universality comes from a lack of specificity. This is the reason why we’re still doing these plays 400 years later. We can continually reinterpret the characters for a new age, and every actor who plays the role (and every director who directs it) will put his or her own stamp on it. This is wonderful, but it’s not really the characters themselves who are driving it. What drives it, I believe, is the language, an almost preternaturally beautiful tone that sticks in the brain. Nobody wants to write that way any more, and nobody wants to read it. Audiences have come to expect a lot more specifics in their characters. I don’t believe that Shakespeare himself would want to write that way, if he were writing now. Shakespeare’s plays are, first and foremost, plays, which contributes to that universality. They were designed to be played by different actors (though it’s hard to imagine that he expected them to last this long, “acted over in states unborn and accents yet unknown,” but he did expect them to travel the country and to be restaged by rotating troupes. They were conceived as empty vessels, and that makes them universal. We could look at some modern playwrights with similar scope: Tennessee Williams, Eugene O’Neill, Anton Chekhov, Henrik Ibsen, Arthur Miller. None of them were as prolific as Shakespeare, who turned out at least a dozen truly great plays and another dozen genuinely good ones (and at least a dozen that would be utterly ignored if they weren’t by the Bard). Of all of those Tennessee Williams has perhaps the greatest array of characters: Blanche DuBois, Stella and Stanley Kowalski, Brick and Maggie, Big Daddy Pollitt, Amanda and Laura. Ibsen also has characters that loom large: Hedda Gabler, Peer Gynt, Nora Helmer. They’re less known among American audiences but are much prized as roles among actors. J.R.R. Tolkien also wrote characters of such mythic scope, ready to be adapted to every new age. It’s too bad that it’s difficult to stage his works well, but his books have been adapted multiple times. I don’t think we’ve seen the last of it, though I suspect the next time the characters will be all computer generated, and so not for several decades. In the same vein I’d look at L. Frank Baum, whose Wizard of Oz books contain a breathtaking array of characters. These are all perhaps less universal than Shakespeare’s, but I’d say it’s only because we’ve come to expect more specificity and less universality. That’s common to other writers of his day, and there’s as much universality in Faustus as in many of Shakespeare’s most iconic characters. In performance, actors imbue that specificity where it does not exist in the text. English Literature: What is a good way to start reading 20th-century English novels? William Shakespeare: What are the secrets to understanding the themes and language of Shakespeare? Authors: Why is J.R.R. Tolkien more famous than Isaac Asimov?